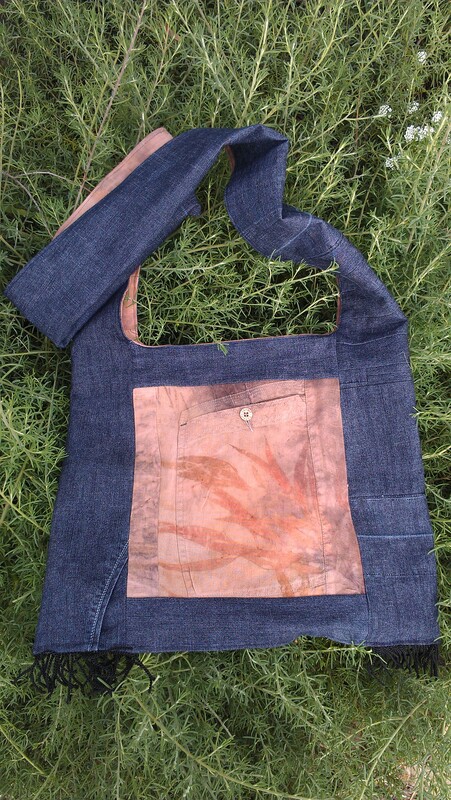 I have been making a bag from two pairs of old pants. One, a pair of second hand jeans, and the other, a pair of linen pants styled for the 1980s that I found in an op shop. Before I leaf-printed them, they were pale green. At first I didn’t like the effect, but it has grown on me. As much as the print, I think what made me want to turn them into a bag was the back pockets. They are glorious pieces of construction. I love a good pocket. The 3/4 jeans feature unusual pockets for jeans, too. I don’t think I ever owned jeans with a welt pocket before. 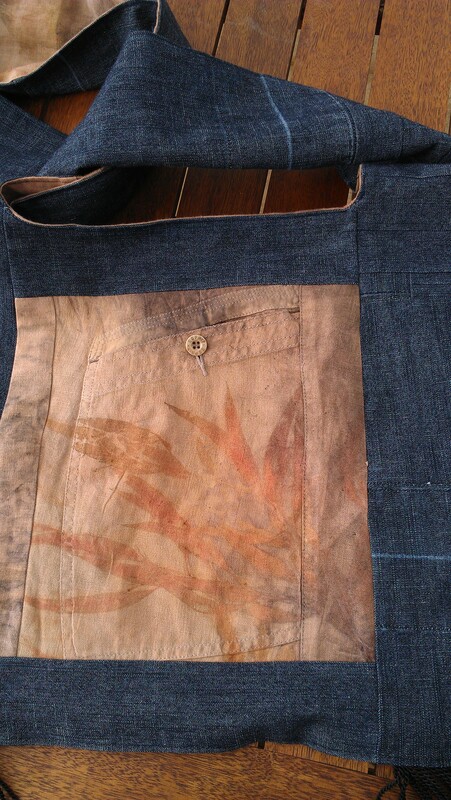 I cut feature sections for the outside of the bag which included the button-down pockets. 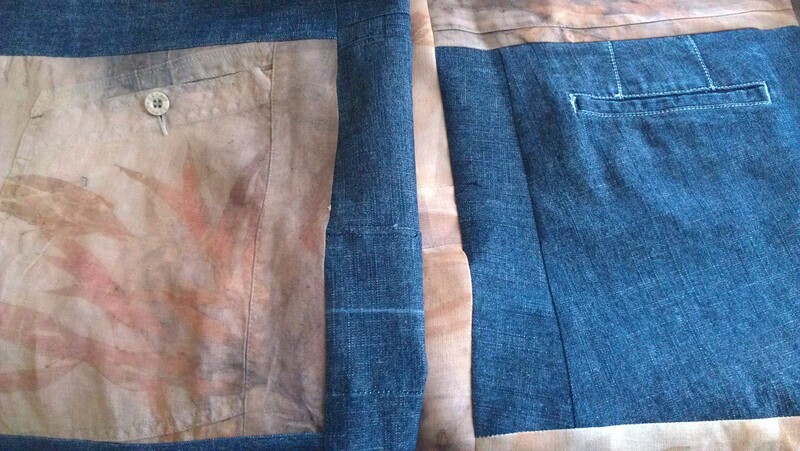 The jeans pockets went on the inside panels. 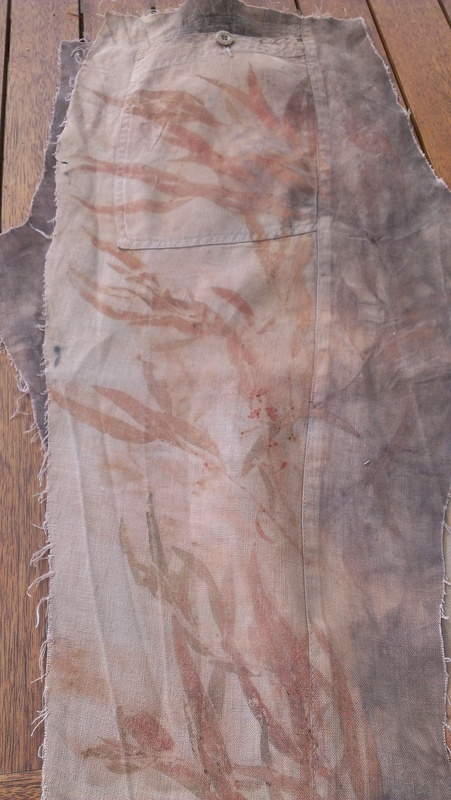 Then I pieced the rest of the garments together to create the straps and lining. It has been a feature of my sewing career that as I’ve moved away from sewing with fabrics gleaned from all kinds of places free or as cheaply as possible out of sheer necessity–into sewing for pleasure and having the capacity to afford to buy lovely fabric…. I continue to love sewing recycled fabrics. 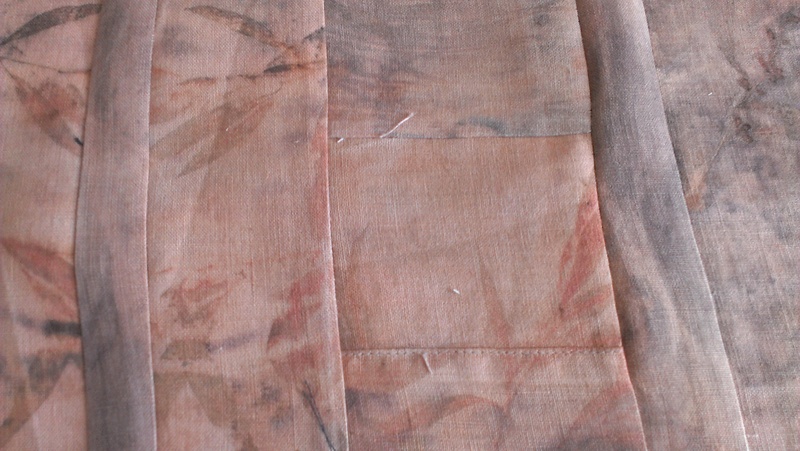 Shirts made from linen tablecloths and flourbags. Quilts from recycled garments. Bags from all manner of fabrics. I especially love retaining beautiful seaming and details like pockets into a new application. Every time I make one of these my beloved makes the case for me/us keeping it. It’s funny, but flattering! I haven’t decided yet if this one stays or goes to a new home. She’s right….. you should keep it! Or, better yet, fill it full of tasty treats (sour dough baguette, cheese, fruit and wine?) and present it to her….. as a ‘just because I love you’ present! By the way…. it’s a wonderful tote!! Thanks so much 🙂 What a lovely idea! I agree its a keeper …I love it to bits ! Thanks a bundle! So kind! I don’t think you should keep it, I think you should give it to me, LOL. This is very interesting to me at the moment, the upcycling, new ideas are stored. Love the pockets too! Thanks, Pia. One of the lovely things about the interweb is being able to see what other people think of. It so often generates ideas for your own projects. I have moved on to another set of pockets already, myself! Cool bag! I love pockets, too. Now you have me inspired to check out the 2nd hand stores….again. Since you love bags, you might like the bag pattern I posted on my blog. It really is a great little bag. Thanks, Pallas! I haven’t seen that pattern on your blog when I’ve been there, so I’m off to look 🙂 Thanks for the tip!